Claudia Coffey was born in 1945 at the end of World War II, the oldest of eight children born to an Army Air Corps staff sergeant and his munitions factory-employed wife turned tobacco farming family in southern Indiana. Although she grew up in the nuclear age of the baby boomer, Claudia's heart's desire was to bring the past to life, with an eye to making history relevant and easy to understand. Following years of research, in 2005 Claudia proudly introduced her Kentucky ancestors to readers in "A Farming Family in the New World: The Barnard Family Saga" and in 2017 Claudia joined forces with her baby boomer cousin, Ronald J. Deatrick, to bring their German Palatine ancestors to life with "Mein Name ist Peter Dietrich: The Deatrick/Dedrick Family Heritage". Both books progress through the centuries from the age of the indentured servant in the American Colonies' infancy, through the fight for independence, the journey west, the war between the states, and on to the present time. In her research, Claudia learned first hand about our national heritage, and saw how we are all truly children of immigrants. Both books are chock full of easy-to-read family stories, photographs, recipes, and illustrations, and most importantly, both books fulfill Claudia's wish to bring the past alive with stories presented in an easy-to-read format. 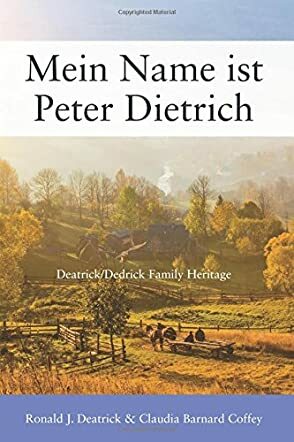 Mein Name Ist Peter Dietrich: The Deatrick/Detrick Family Heritage by Ronald J. Deatrick and Claudia Barnard Coffey is the story of the Dietrich family settled in the Rhineland-Pfalz or the Palatinate as it was known. Their peaceful life was disrupted on All Hallows Eve 1517 when Martin Luther nailed his Ninety-Five thesis against the Catholic Church and then came the Thirty Years War. It was at this time North America opened up lands for settlement, giving the Germans a chance to own land. The stage was set for migration and among them was Johannes Peter Dietrich who would become the originator of the Deatrick/Detrick line in America. It is the story of immigrants who played a role in shaping the current United States of America and how they survived in a new land with their hard work. The story captures the thoughts, emotions, and experiences of Peter Dietrich and takes readers on an engaging journey. The book throws light on the plight of the immigrants and their difficult journey, and how Peter would learn the hardships of the frontier. The authors speak about the fight for freedom in the Revolutionary War and how the Detricks carry the fight for freedom. The story of this family is revealed to readers with the help of letters, newspapers, wills, stories, recipes, and pictures that will pull readers right into the book and form a connection with the characters. The narration is detailed and descriptive and it captures the life of an immigrant vividly. The writing style of the authors is fluid and they give a good pace to the story. Mein Name Ist Peter Dietrich: The Deatrick /Detrick Family Heritage by Ronald J. Deatrick and Claudia Barnard Coffey is a masterful, compelling documentation of a family’s journey from the Palatinate Region in Germany to America and their heritage, a story that is told with beautiful and powerful images, and a great deal of epistolary. In these pages, readers are introduced to accounts of hardships and tribulations, the struggles and hopes of a family of immigrants, and the secret to their success in the New World. The reader will be introduced to the drama from the moment of goodbye to landing in Philadelphia after a dangerous voyage, to committing to fight under the British Crown, to war under General George Washington and a lot more. Set in the period between the 1800s and the 1900s, this narrative captures very touching and dramatic historical moments, a relevant reference to American history and to what life could be like living on alien soil. This is a story of courage, of family, and the price of freedom. The writing is good and there are many passages that will draw readers completely into the narrative so that they won’t want to put this book down. Here is a great non-fiction book that reads like fiction. Ronald J. Deatrick and Claudia Barnard Coffey must have done their homework well, researching the historical elements of the story and communicating them with clarity. Mein Name Ist Peter Dietrich: The Deatrick /Detrick Family Heritage will resonate with many immigrants, and readers will find a lot of entertainment and encouragement in these pages. What does it take to live a successful life as an immigrant? Mein Name Ist Peter Dietrich: The Deatrick /Detrick Family Heritage by Ronald J. Deatrick and Claudia Barnard Coffey introduces readers to the history of a family that leaves the Palatinate Region in Germany for the United States in the second half of the 19th century and what becomes of this family thereafter. America was a land of promise that welcomed immigrants from around the globe, but what did it cost those travelling to this new world? Readers watch compelling characters that are determined to make the best of their lives, away from the troubles that Germany caused them. But arriving in the United States, they have other problems to handle, including health, the political situation of the country, and many other challenges associated with being an immigrant. This is a beautiful story that seems to be so honestly written and well researched, a story that will find great resonance in the hearts of immigrants. The authors have published personal and family letters as they were written and such letters are emotionally charged, some fraught with advice, others detailing the challenges of the life the protagonists lived. The reader understands a lot about the conflict that animates this book, characterization, and the plot through the masterful use of epistolary. For instance, the themes of conflict, poverty and hardship come across vividly through the letters. In a letter dated Oct 4, 1861, one written during the Civil War that caused the separation of the family, H.H. Detrick, writing to his wife said: “Dear Wife I have no money to send to you and I don't know when I will get any and if you want any you must try to sell some rye if you can spare it, and if you can't spare it you must try and sell one of the calves and get what you can.” This book is a moving tribute to American history, an inspirational journey that will help millions learn that hard work always pays. Mein Name Ist Peter Dietrich: The Deatrick /Detrick Family Heritage by Ronald J. Deatrick and Claudia Barnard Coffey will be a very entertaining read for many readers. Mein Name Ist Peter Dietrich: The Deatrick/Detrick Family Heritage by Ronald J. Deatrick and Claudia Barnard Coffey is a nonfiction narrative that looks at the life of an immigrant family, their journey to the United States of America, the challenges they face, and how they survive troubling moments of history to create a wonderful legacy. Set between the 1800s to the 1900s, this story vividly showcases the effects of political turmoil on a family. The Palatinate Region in Germany is suffering a lot of unrest as Germany is at war, and a family decides to seek greener pastures in the New World. The reader follows the protagonists of this inspiring story as they undertake a dangerous journey across the seas, finally alighting in Philadelphia. But is America the land of promise they have dreamed about? It seems like their challenges are just beginning. There is a lot to enjoy in this compelling narrative. First off, I enjoyed the stylistic elements of the story and Ronald J. Deatrick and Claudia Barnard Coffey combine journaling with epistolary to enhance the story, deepen characterization, and open new layers in the plot. Readers will also enjoy the historical references such as the experience of war under the British Crown and General George Washington. The story is further embellished with real photos of the family. The kind of conflicts developed in this story will speak to immigrants in particular ways. Mein Name Ist Peter Dietrich: The Deatrick/Detrick Family Heritage is a story that powerfully shows what leaving one’s birthplace and travelling to other lands entails and it will offer a lot of encouragement and inspiration to immigrants.